Team chemistry is an enigma. Perhaps the biggest mystery in sports, it’s an elusive component to winning that every owner, general manager and head coach has been trying to decode for years. 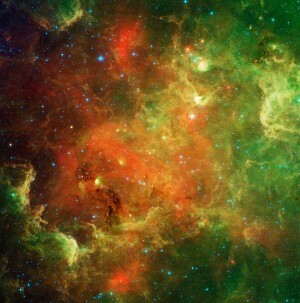 No one is quite sure what comprises the winning formula. All that is known is that it’s a delicate balance, one that requires a precise mix of personalities that will mesh into a functional unit. When it’s done right, it’s a beautiful thing, as players come together to form a sum that is greater than the individual parts. And when it goes awry, it’s a disaster, as a franchise disintegrates from within. It’s not just the stars who play a role in this mysterious key to winning. In fact, bit players can often have just as big of an impact. Case in point: The Colorado Avalanche. A week ago, they were drifting toward the bottom of the Western Conference standings. Fresh off of a four-game road trip in which they came up on the short end of the scoreboard three times, including an embarrassing 5-1 setback in the finale at Winnipeg, the Avs looked to be a team in disarray. As a result, they appeared to be sellers as opposed to buyers as the NHL’s trade deadline approached. In a move that made very few waves, they sent defenseman Kyle Quincey to Tampa Bay, who then re-routed him to Detroit for a draft pick and a prospect, in exchange for forward Steve Downie. On the surface, the trade seemed like nothing more than a salary dump, as Downie earns roughly $1.4 million less per season than Quincey. For those a little less cynical, the move also made sense from a hockey standpoint, as Colorado has a logjam of young defenseman who need more ice time. But the real benefit may have come from how the deal affected the locker room. During the past week, Colorado has looked like an entirely different team. 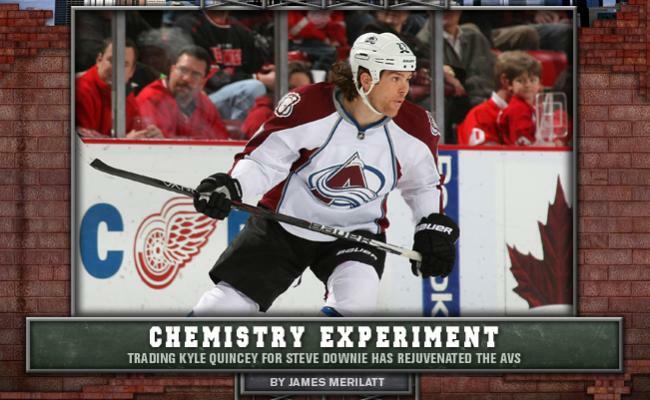 Since swapping Quincey for Downie, the Avalanche have been on a tear. They routed L.A. in the first game after the trade, 4-1 at Pepsi Center, went to Columbus two days later and blanked the Blue Jackets by a 5-0 count, and then went into Detroit the next night and handed the Red Wings their first regulation home-ice loss in 25 games, hanging on for an impressive 4-3 victory at the Joe. Has the turnaround all been due to Quincey being removed from the equation and Downie being added back in? That’s hard to say, but it’s certainly had a big impact. On the ice, Downie has paired with youngsters Ryan O’Reilly and Gabriel Landeskog to form a dominant line. He’s tallied five points in his first three games as an Av, while also posting a plus-five in that time. And in the locker room, the Avalanche seem to have ridded themselves of a player who had gone off the reservation. That’s not to say that Quincey is a bad guy; he’s not. But it was obvious from his post-trade comments that the defenseman had stopped buying in to what head coach Joe Sacco was selling in the locker room. He’s since come out and apologized for the comments, but Pandora is already out of the box. Quincey didn’t want to be in Colorado; he couldn’t wait to get the heck out of Dodge. And that type of attitude is typically hard to hide. It was almost certainly evident to everyone around him. While that conclusion may require some reading between the lines, the results on the ice are much simpler to interpret. Since trading a guy who admittedly couldn’t wait to leave, the Avalanche are 3-0. Since bringing in a player who wanted to be an Av, Colorado has outscored their opponents 13-4 in three games. Since making a subtle tweak to the team’s roster, the burgundy and white are playing their best hockey of the season. Sometimes, it doesn’t take a blockbuster trade to overhaul a franchise. If a move has the right effect on a team’s chemistry, altering the makeup in a way that gets everyone on the same page and rids the locker room of divisiveness, it can transform an organization overnight. The Quincey-for-Downie trade appears to be Exhibit A. Want more Mile High Sports? 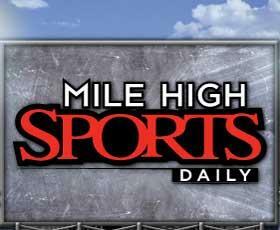 Check out Steve Quinne’s award-winning blog at milehighsports.com. Today, SQE evaluates the Broncos batch of pending free agents. Site contents copyright © 2019 Recorder Online	except as noted. All rights reserved. | 86 queries in 1.316 seconds.